One perennial prize that always seems up for grabs for tech companies – but has yet to be really conquered in any large capacity – is payments. There’s a considerable list of startups and big tech companies that are trying to tackle payments, from Stripe to Square to Apple Pay and everything in between. But for the moment, they’re mostly chasing around the margins trying to score wins on convenience, experience and other cool features- which, don’t get me wrong, are a good place to start. In the meantime, the big dogs keep on making money, as dominant as ever. The big dogs I’m referring to are the credit card payment networks – Visa and MasterCard especially. (American Express is a bit different, since they’re also a bank and special in other ways, so I’m not really going to talk about them here. I’ll also be very US-centric in this post; sorry, world.) At first thought, a company like Visa should be exactly the type of company that gets disrupted by tech – it’s a middleman that makes piles of money at a major point of friction, and that’s precisely what the internet is good at eliminating. Right? In reality, Visa and MasterCard have proven to be harder to get rid of than the eager TechCrunch Disrupter might hope. Payments are trickier than many people realize, and the credit card processing companies occupy an interesting space in that ecosystem (the oddities of which this blog post explains nicely). And odds are they aren’t going anywhere. To understand why, it’s worth going back to the core features that make credit cards valuable. A lot of the discussion around their staying power focuses on their network effects: they own the rails between all of the merchants, payment terminals and banks, and benefit from their infrastructure advantage and economy of scale. This is certainly true, but it’s not the whole story. While it’s straightforward to appreciate how anchored the CC companies are from the merchant / point of sale / banking side of things, we don’t talk as much about how entrenched they are for consumers, and how difficult the cards will be to dislodge from our everyday lives. Here’s the funny thing about credit cards: your bank (not Visa) issues you the card and your credit; you visit your bank’s website (not Visa’s) to pay your card balance, and you call your bank (not Visa) when you need customer support. And yet the key relationship that matters is the one between you and Visa. Why? Because the job that a credit card does for you is it gives you the power to purchase (nearly) everything, anywhere, and the confidence that it will always work. Your bank doesn’t give you this power, even though they’re providing you with the actual credit. Visa does, because they own the network, so they’re the ones who make it work every time. You don’t trust your bank that it will just magically happen, you trust Visa. In other words, what Visa does for the consumer is uncouple the ability to make a purchase from the requirement of immediate cash on hand. This applies on two levels- it eliminates the requirement of handing over cash in person (whether at a physical point of sale, or over the internet) and it eliminates the requirement of even owning that cash at all – at least for the short term. 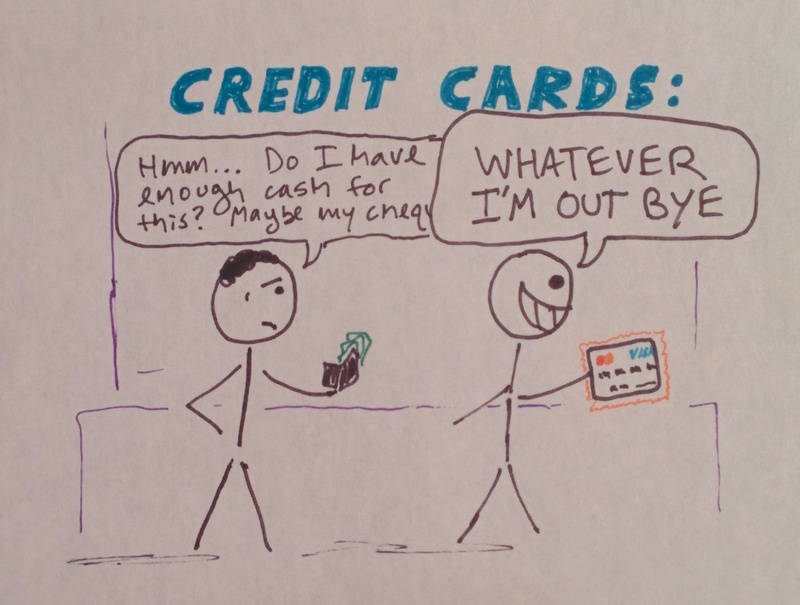 You just don’t have to think about anything when you use a credit card; you just buy. And we looooove it. That’s why we use credit cards to buy everything from coffee to Netflix to boats – whether we have the money or not. Once again, there are two sides of the Credit Card dominance coin: ubiquitous merchant acceptance and network effects on one side, durable consumer loyalty on the other. That’s pretty powerful. So how, if at all possible, could Visa and friends fall? I can imagine three possible scenarios where this could happen. The first two probably won’t work on their own. The third, though, is crazy enough that it might. The first scenario is direct competition: a powerful group tries to build a direct competitor to the payment networks that slides on its own rails, is accepted by enough retailers, and gains sufficient traction with consumers. This way is the most straightforward, and the incentives to build it are very clear – credit card fees are brutal for retailers, especially large-scale, low-margin ones. But it’s also really hard to execute. Consider Merchant Customer Exchange (MCX), a network of of major US retailers headed by Walmart that is trying to compete head to head with the credit cards. Unfortunately for them, MCX is getting pummelled by competitors like Apple Pay (more on them later) and resisting widespread adoption because it asks consumers to adopt new behaviour that has no delta of improvement over their existing habits. This is the key problem for any potential competition – the consumer experience of using a credit card is just too good; consequently, the room for potential improvement along any conventional lines is almost zero. So even though MCX’s solution represents a significant improvement for the merchants, it can’t work without a real mechanism to get consumers to change their purchasing habits – and right now, they don’t have one. The second scenario is innovation: hip, smart tech companies build features and products that sit on top and then eventually marginalize the payment networks. The playbook would look like this: a company comes along – (let’s call them Triangle) with a plan to be the payment system for the 21st century. They come up with some cool innovative feature that sits on top of the existing credit card networks, and allows consumers to do some new and genuinely useful things they couldn’t do before like accept payments directly from their phone. Eventually, as Triangle spreads to more points of sale and claims a greater share of transactions, people begin to associate them more strongly with the transaction than Visa. Eventually, Triangle owns the customer experience and all the leverage that comes with it, and Visa is relegated to a dumb, undifferentiated pipe. This is a fun-sounding plan, but there are some crucial obstacles. (They are laid out very nicely in this old Exponent episode which is worth listening to. ) Until you have real leverage over the payment networks, it’s quite hard to make any money. If Triangle charged a meaningful transaction fee over the top of what the credit cards already demand, merchants would reject it outright – the existing fees are painful enough, and they aren’t likely to tolerate any more. But if they don’t charge this fee, or scrape by on a tiny amount that merchants will accept, then the business becomes extremely hungry for investment cash and will be difficult to grow sustainably. And even with huge VC dollars, it’ll take a long time for Triangle to gain any kind of real leverage over Visa, and plenty can go wrong in the meantime. So without widespread adoption from merchants, it doesn’t matter how new and innovative the experience is for the consumer because they’ll never get to see it – but without charging sufficient fees, it’s hard for it to grow at all. 1. By integrating Apple Pay with consumers’ existing credit cards, the adoption barrier for new consumer behaviour becomes vastly lower, while reinforcing the core job that the credit card does for the user – giving you the confidence to purchase anything, any time by uncoupling ability to pay from cash on hand. 2. Down the road, if Apple decides to run its usual playbook and bully its partners into lowering their fees, it probably won’t be Visa they go after – it’ll be the card issuing banks. Why? Because for each individual transaction, Visa is actually only taking a small portion of the fees – the majority is claimed by the issuing bank of the payer. Additionally, there are a lot more card-issuing banks than there are credit card networks, and they’re all competing with each other to poach the best clients and stay relevant in the new payments world. The banks, in other words, have the most to lose from Apple exerting their usual leverage. Visa, on the other hand, largely benefits due to increased transaction volume overall – they’re not the supply, they’re just the rails. 3. Apple is tacitly acknowledging that, despite the fact that Apple Pay has the potential to be a great user experience from a convenience perspective, there isn’t actually any delta of improvement in the core job that credit cards do – the uncoupling of purchasing power from cash on hand. Once again, the critical relationship from a job-to-be-done perspective is not between you and your bank, nor is it between you and Apple – it’s between you and Visa. Is it worth it for Apple to one day try to attack that relationship head on? Who knows, but I’m not holding my breath. So with all of those first two scenarios being long shots to unseat the credit card networks, what’s the third crazy option? The third option is this: Visa could potentially – although not necessarily – get disrupted if there’s an evolution in the way we purchase things in general. Specifically – as I’ve written about before – a shift away from individual ownership and towards continuous access. Call it the access economy, call it on-demand, call it whatever you want – but I strongly believe that we’re about to see a subtle but significant shift away from individual ownership of discrete things (‘My X’) and towards continuous, use-based access to many of the things we need (‘I use X’). We used to buy music, now we use Spotify. We still buy cars (for now), but we increasingly use Uber. In other words – less goods, more services. And we’re just at the very beginning – ubiquitous access and unnecessary ownership will shape our lives a whole lot over the next few decades in ways we haven’t really thought about yet. The shift from ownership towards access implies a corresponding shift away from discrete payment for things and towards continual payment for things. 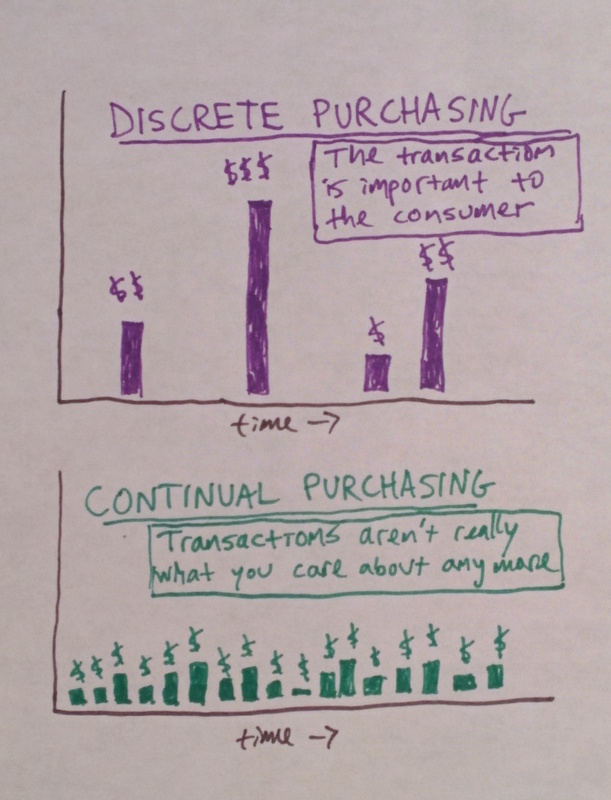 What does continual payment look like in practice? If I buy a car, that’s definitely a discrete purchase – but so is paying for an Uber, the first time. But if I pay for Uber the fifth time this week, or the fortieth time this month, or the four hundredth time this year – does it really make sense to think of each of these as a discrete purchase anymore? Or am I just using Uber, and paying for it continually? My relationship with Uber is less like a series of distinct transactions and more like a continually updated ledger outlining how much I owe. Same with my Spotify subscription – the ten dollar payment I surrender each month is definitely a discrete transaction, but in aggregate, I’m paying periodically and continually for the access that Spotify gives me. Now here’s the critical part: you’re probably all yelling at your screens, “I use my credit card to pay for all of those things!” Yes, you do. But the job that your credit card is doing for you has changed. In a world filled with discrete purchases, what matters is the ease and confidence with which you can make each purchase, and the uncoupling of purchasing power and immediate cash on hand. This is Visa’s killer function, and why they have so much staying power. But in a world full of continual purchasing, the transactions aren’t what’s important. What matters is your credit, and Visa doesn’t give you credit. Your bank does. When single, discrete transactions are what matter, Visa is king because they own that magical ability to make the transaction ‘just work’. But when your purchasing relationship with a merchant is more like a continually updated balance sheet, and credit is what matters, the door opens for other companies – Paypal, Apple Pay, Facebook’s new payment feature, banks, Bitcoin, whoever – to really rethink things. And it’s not because anybody needs to beat Visa at its own game- it’s just that Visa’s game isn’t necessarily the most important thing anymore. Just like in my last post about the workplace stack – when billion dollar companies begin to die, it often isn’t at the hands of their competitors. It’s because they go from one day being the best at what they do, to the next day being still the best at what they do except it matters a little bit less. If Visa should ever fall from its perch, this could be how it happens. It’ll take a very long time for the credit card networks to go away, if they ever do – but with the shift from discrete, deliberate transactions towards continual purchasing, especially when enabled by premium tools like Apple Pay (or whatever Bitcoin ends up enabling, who knows), Visa’s leverage over the banks and merchants may eventually wane. Being the best company in the world for making purchases just isn’t as important on your 33rd Uber ride of May 2025: the purchase isn’t really the thing that matters anymore; your credit is what counts. Yes, Visa is still there to provide the payment rails. And hey – they might pull it off and stay on top – they’re a smart company, and know what they’re doing. But as the critical job that they perform becomes a little less visible and less important, the door opens – if only slightly – towards eclipse.